You watch as the woman in the shawl lays out the stiff pasteboards one by one, crossing and intersecting them in a pattern that you have to assume holds some meaning for her. Of course you don’t expect much at the county fair, where you paid two tickets to have your fortune read, but suddenly this woman is telling you intimate details of your life. How did she do it; how can she glean information from a tarot card reading? There is no way to explain how every tarot card reading’s conclusions are arrived at - there are 78 cards in a tarot deck, and the potential for various configurations based on the spread (the pattern in which the cards are layed out - of which there are dozens of different types) are legions - add in the personal interpretations of the reader and that number becomes infinite. What can be given, however, is a general explanation of how a tarot card reader approaches reading the spreads. Among the 78 cards of the standard tarot deck there are the Major Arcana (those cards that have much heavier influence on a reading - a single card from the Major Arcana can completely flip a reading on its head) and the Minor Arcana. There are 22 Major Aracana cards and 56 Minor Arcana cards, which are dived into four suits, the Cups, Swords, Pentacles and Wands. This is the key to understanding how tarot cards are read - the cards represent things. When you have a card that is “Death” (one of the Major Arcana, naturally) it does not mean that the person the reading is for is going to die, necessarily. It may not even mean death- it is a symbol of change, of an ending. And often when one thing ends, another begins - so the card Death may even be a positive influence on a reading. The Major Arcana cards represent universal aspects of human nature (Death, Lust, Loss, Harmony, and Change to name but a few) and have a heavy influence on a reading. One is enough to set the tone of a reading, having more than one can really muddy the waters. The Minor Arcana are more representative of individual emotions and actions, and serve to fine tune a reading. For an example here are the meanings of the Ace card from each suit: Ace of Wands represents the beginning of something, often an idea, and represents initiative of thought. The Ace of Cups represents the beginning of an emotion, often love, and represents the start of or search for an emotional component in life. The Ace of Swords represents the beginning of self, often the severing of a relationship to establish an identity, such as a divorce or coming of age. The Ace of Pentacles represents new money or new fortune, such as coming into an inheritance or a raise at work. Notice how all the Aces are a beginning of something; each number has its own meaning and representation in each suit, and the suits further define what that meaning is. Some assume that each card has a specific meaning, and a reading is as simple as following a chart. This is only partially true. 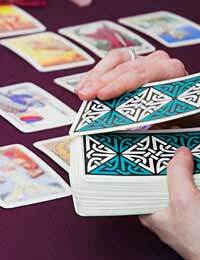 The real reading is more an interpretation of the card’s meanings, and is supposed to be guided by the reader’s emotional and spiritual connection with the tarot cards.